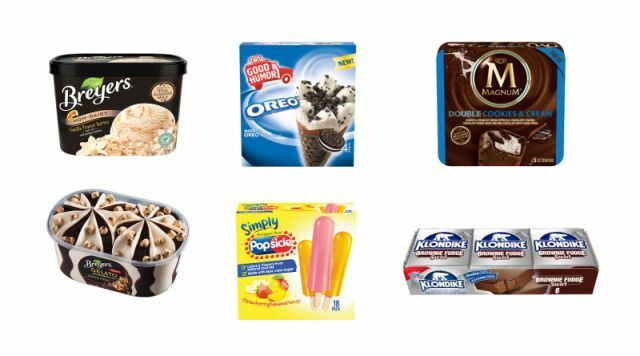 Unilever introduces 16 new flavors/varieties of frozen treats for 2017 across their many brands. - Simply Popsicle - A new line of ice pop made with cane sugar and with flavors and colors from natural sources. The new line contains no high-fructose corn syrup and has 40 calories per pop. The line features the following flavors: Strawberry-Banana and Mango; Berry and Pineapple; Orange, Cherry or Grape; and Strawberry and Raspberry. - Popsicle Star Wars Ice Pops in three flavors: First Order Cherry, Blue Raspberry Resistance, and Galactic Watermelon. - Popsicle Despicable Me Minions Ice Pops in two flavors: Compai Blue Raspberry and Bello Yellow Lemonade. - Popsicle Sours in three flavors: Orange, Blue Raspberry, and Green Apple. - Two new original Popsicle flavors: Banana and Lemon-Lime. - Breyers Non-Dairy Vanilla Peanut Butter - made with almond milk and non-GMO-sourced ingredients. - Breyers Non-Dairy Oreo Cookies & Cream - Like their regular Cookies & Cream but made with almond milk instead of milk and cream. - Breyers Chocolate Mint - Dark chocolate ice cream with chocolaty chips swirled with mint ice cream. - Breyers Cinnamon Swirl - Cinnamon-sugar swirls with vanilla frozen dessert. - Breyers Butterscotch Blondie - Blondie pieces with vanilla ice cream "to bring out the brown sugar and buttery flavors of butterscotch." - Breyers Gelato Indulgences Cookie Dough - Sweet cream gelato with a fudge swirl and chocolate chip cookie dough pieces. - Breyers Gelato Indulgences Pistachio Biscotti - Pistachio-flavored gelato with a pistachio swirl and biscotti crumble. - Breyers Gelato Indulgences Cinnamon Roll - Vanilla-cinnamon gelato with cinnamon sugar and a baked cinnamon topping. - Good Humor Oreo Cone - A chocolaty cone filled with vanilla frozen dessert that's blended and topped with Oreo cookie pieces. - Klondike Brownie Fudge Swirl Bar - chocolate ice cream with fudge swirls covered in a thick, milk-chocolaty shell. - Magnum Double Cookies & Cream - Cookies and cream ice cream, chocolate cookie sauce, and a "crackling" coating made with Belgian chocolate and more cookie pieces. - Magnum Double Chocolate Hazelnut - Chocolate hazelnut ice cream, hazelnut sauce, and a "crackling" coating made with Belgian chocolate.